Another visit to the Greek and Roman Galleries at the Metropolitan Museum of Art with fellow EDMer Paula. She is returning to Brazil at the end of the month, so this was our last time to sketch together for awhile. We're both hoping that she will come back to NYC for work - regularly. 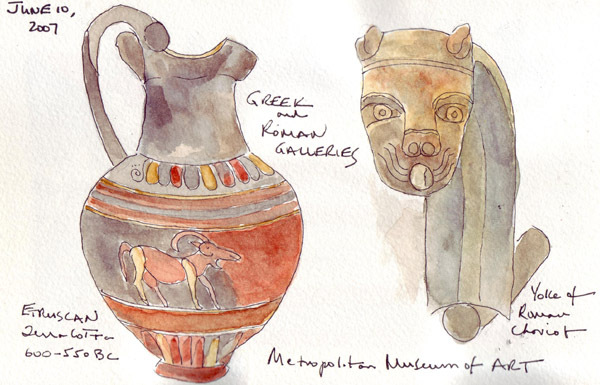 There are cases and cases of artifacts that are wonderful for sketching. The ewer on the left was so beautiful because of the colors. The funny head on the right is one end of the yoke for a real Roman Chariot - an amazingly beautiful piece. 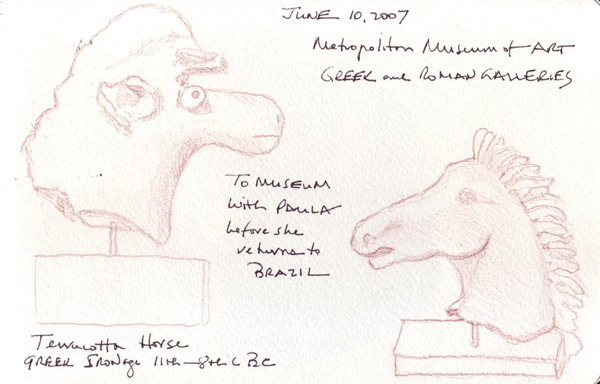 These are two small terracotta horse heads - even though one of them looks more like a moose without horns. I love using a colored pencil for these sketches. I could spend many days in these galleries before even finishing all of the types of artifacts. It was a beuatiful cool, sunny morning last Sat and I went to the Metropolitan Museum of Art rooftop sculpture garden to read for 2 hours(needed to work on the 500+ page book I have for Book Group tonight). 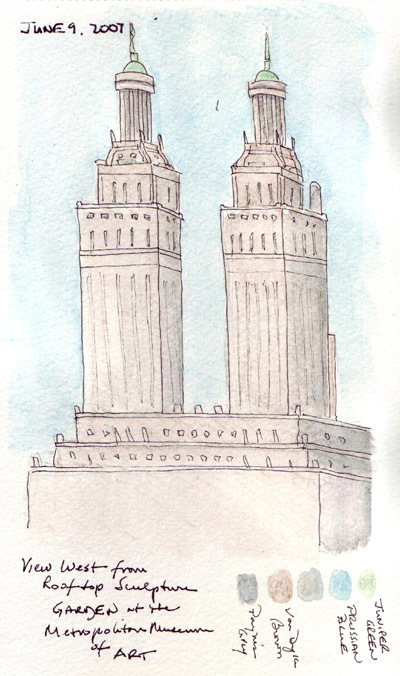 While reading I took approximately 20 minutes to sketch these towers on the building at 74-75th St and used watercolor pencils to add color. The 4 pencils I used are listed in the paint samples. It was liberating not to worry about all of the windows - and not to really try to capture all of the architectural detail. When I enlarged my digital photo on the computer screen at home, I could really see how complex the towers are. I have lots of trouble staying loose. Even though I sketch quite quickly, it is too tight and I can become obsessed with detail. Not that I put too much detail into a sketch, just that I can't seem to sketch it if I can't see it. I envy those in the EDM group who can stay really loose and capture images of something - this week Casey in Hong Kong, Hashi on her LA city walks, and Gabi on the bus. I want to be able to do both - depending on the project. 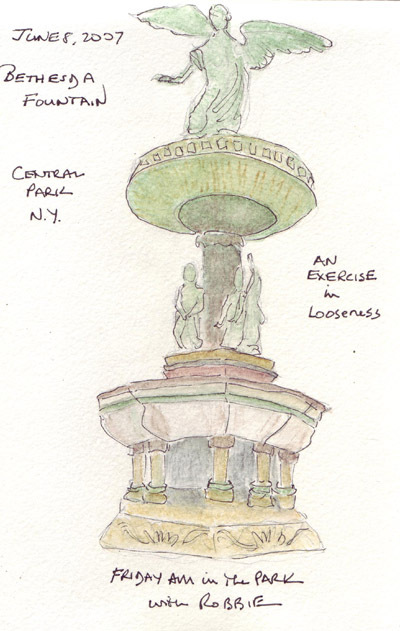 So this morning I brought my sketchbook and watercolor pencils with me when my husband and I took our grandson to Bethesda Fountain and I forced myself to do just a really loose sketch, add color, and then water - all in < 30 minutes. I definitely need to have more of these sketching sessions. Need more practice!! My husband had these earrings made for me for our 25th wedding anniversary because I liked black roman coins in gold jewelry that I saw somewhere with him. He then gave them to me at a lovely dinner in a villa in Padua, Italy - so the roman coins returned home! The coins are more black than painted here. 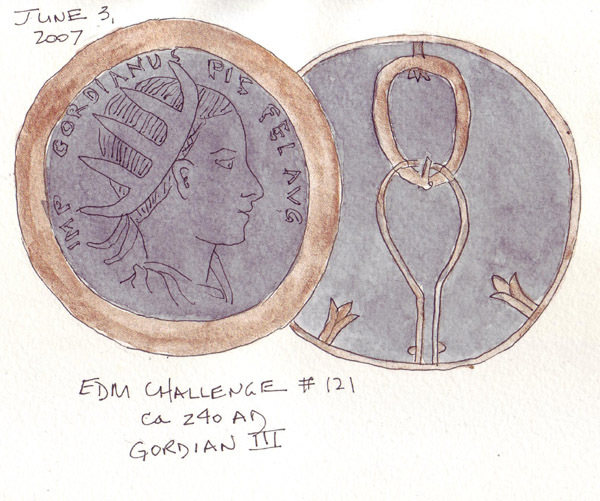 As I was sketching the front and back of one earring last night, I also "googled" Roman coins and was able to identify my coins as Gordian III - from approximately 240 AD. There are many, many images of Gordian III coins and I would need to better see the images on the reverse side of my coin to be more specific. Both earrings use the same image on the front of the coins. I used gold gouache for the gold casing and back of the earring. 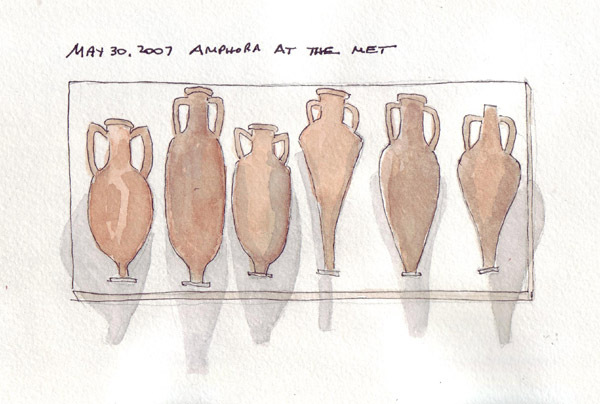 May 30th: There is a wonderful wall display of amphoras in the new Greek and Roman Galleries at the Metropolitan Museum of Art. I was really attracted to the composition, the colors, and the shadows. May 31st: Big Ben has such an intricate guilded structure around the clock face and I could see the details when I zoomed in on my photo. I used W and N gold gouache for all of the gold. 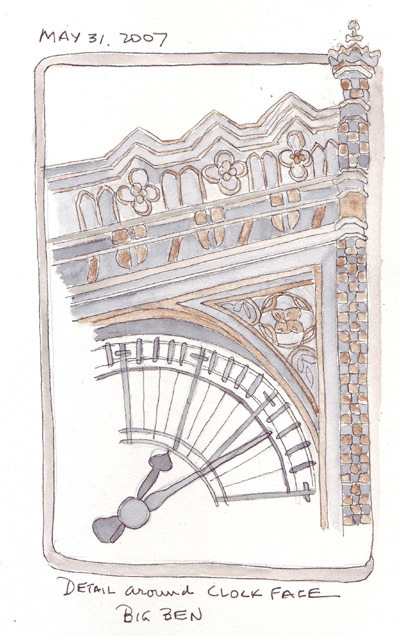 This is the second sketch in my Big Ben series in my recycled Elizabeth I book. This is the final sketch in my "Every Day in May" series. For me this project was an exercise in uploading my daily sketch rather than doing a daily sketch. It was time consuming on work days when I was tired. I also didn't like the slight change in my attitude toward my daily sketch, i.e. I actually had to upload whatever I produced each day. The major advantage is to have a full months body of work saved on my blog - and it really is eclectic: figure drawing including yoga poses and nudes; museum sketches as I repeatedly visited the Metropolitan Museum of Art; several pages in my recycled books: the 10 blocks series of NYC and Big Ben; and of course the EDM Challenges!